The new edition of this bestselling book builds on the author’s extensive administrative and consulting experience as well as scholarship on faculty rewards. It includes additional discussion of important foundational issues as well as practical forms and ideas gleaned from disciplinary groups and campuses throughout the nation. 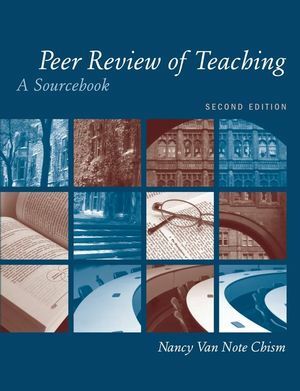 Like the first edition of Peer Review of Teaching, this new edition is offered in the hope that providing examples and suggestions will not reduce the important work of peer review to mere forms or rigid procedures, but will empower faculty to articulate criteria and standards, perform the reviews systematically and thoughtfully, and realize that engaging in peer review is an approachable and worthwhile professional task. Updated to reflect the emphasis on student learning as the ultimate goal of college teaching, it incorporates new ideas and references from the literature. The most notable change in this edition is a discussion of peer review within special contexts for teaching, such as clinics, studios, and practice settings. The turn to active engagement in learning has also led to increased use of problem-based learning, the case study method, and other approaches that traditional forms for peer review do not address. Similarly, the explosion of the use of instructional technology calls for an articulation of new approaches to evaluating web-based instruction. Nancy Van Note Chism is professor of higher education in the Indiana University School of Education at Indiana University-Purdue University Indianapolis (IUPUI), where she teaches courses in qualitative research, professional development, and college teaching and learning. Between 1999 and 2006, she was associate vice chancellor for academic affairs and associate dean of the faculties at IUPUI, providing leadership for faculty hiring and advancement functions such as promotion and tenure, awards, and faculty development. Her work in organizational development included administrative development and physical spaces for learning. Previously, Dr. Chism was director of faculty and TA development at The Ohio State University and an adjunct faculty member in the university's College of Education. She has directed or participated in several major funded projects, sponsored by the Pew Charitable Trusts, Lumina Foundation, National Science Foundation, Lilly Foundation, and Fund for the Improvement of Postsecondary Education. She is past president of the Professional and Organizational Development Network in Higher Education and is recipient of the Bob Pierleoni Spirit of POD Award. Dr. Chism is the author of 60 edited books, book chapters, and journal articles on teaching and learning in higher education and developing faculty and teaching assistants as teachers, with particular emphasis on multicultural teaching, instructional technology, learning environments, and program evaluation. She has consulted on more than 50 campuses in the United States and abroad. Dr. Chism received a B.A. in English from Fordham University, an M.A.T. in English and education from Smith College, and a Ph.D. in educational policy and leadership from The Ohio State University. 1. Developing a rationale and Understanding of Peer Review. 2. Setting Up a System for Peer review. 3. Understanding Roles and Goals of a Peer Review System. 4. Identifying the Focus of a Peer Review of Teaching System. 5. Peer Review of Course materials. 7. Leadership for Teaching: Contributions to Scholarship of Teaching and Departmental Teaching Efforts.